It wasn’t just Henry VIII’s wives that bore the brunt of his ire. His closest pals also met untimely ends for rubbing His Majesty the wrong way. One of the most unexpected was his lifelong friend and confidante Sir Thomas More. Born in London in 1478, More studied Law after serving as a page to the Archbishop of Canterbury. He showed great proficiency as a scholar, studying Latin, Logic, History, Mathematics and French. In 1497, More met renowned scholar and humanist Desiderius Erasmus and struck up a life-long friendship. A deeply spiritual man, More was torn between the secular and the religious life and seriously considered abandoning his legal career to join a monastery. In the end, Thomas decided that wasn’t for him, but did occasionally wear a hair shirt and reportedly practiced self-flagellation. More had four children by his first wife who died in 1511. He remarried a wealthy widow named Alice Middleton and raised her daughter Margaret as his own. He provided all his girls with excellent classical educations, a rarity during a time when women were considered little more than property and breeding machines. In 1516, More’s humanist masterpiece Utopia was published. It enhanced not only his personal reputation but also that of his country, which was still regarded as a provincial backwater in many ways. He became more active politically during this period as well. While he was working on Utopia, Cardinal Wolsey, the King’s chancellor and all-around right-hand man, sent him to Flanders to look after the interests of English merchants. Council and a knighthood, presented with land in Oxford and Kent, and, above all else, the devotion and love of his King. Henry would often arrive at More’s Chelsea home unannounced for dinner, after which the two men would gaze at the stars enjoying long conversations together. Thomas was one of the few people who were allowed to call the King “Harry” and speak truthfully to him without fear. The tide began to turn for More after Anne Boleyn entered Henry’s life, and the King began looking for ways to discard the staunchly Catholic Queen Catherine of Aragon, who was very dear to Sir Thomas. When Cardinal Wolsey proved unable to secure an annulment from Pope Clement VII, Henry gave him the boot and appointed Sir Thomas as Lord Chancellor in 1529. This was a promotion More most assuredly did not want. The King had begun embracing the Protestant belief that the Pope was merely the Bishop of Rome and had no authority over the Church in England. Thomas had Henry’s back on everything up until then, but he could not, and would not, deny papal authority. This all came to a head when Thomas refused to take an oath validating the Act of Succession, which essentially proclaimed Henry’s first marriage invalid and named the King Head of the Church in England. By the Treasons Act of 1534, this made More guilty of treason. More’s conscience wasn’t as malleable as many other people’s who just took the oath with their fingers crossed behind their back. This got More tossed in the Tower in April of 1534. When Sir Thomas finally went to trial on July 1, 1535, the panel of judges included the new Queen Anne Boleyn’s father, brother, and uncle. Not a good sign. If any person or persons, after the first day of February next coming, do maliciously wish, will or desire, by words or writing, or by craft imagine, invent, practise, or attempt any bodily harm to be done or committed to the king’s most royal person, the queen’s, or their heirs apparent, or to deprive them or any of them of their dignity, title, or name of their royal estates … That then every such person and persons so offending … shall have and suffer such pains of death and other penalties, as is limited and accustomed in cases of high treason. Being a lawyer, More knew well how to get around the situation in court. He simply refused to answer any questions pertaining to the King’s supremacy over the Pope with regard to the Church of England. By not giving his opinion on the matter, he wasn’t denying the King of his “dignity, title, or name.” But Richard Rich, the Solicitor General for England and Wales, testified that More stated in his presence that the King was not the legitimate head of the English church. Can it therefore seem likely to your Lordships, that I should in so weighty an Affair as this, act so unadvisedly, as to trust Mr. Rich, a Man I had always so mean an Opinion of, in reference to his Truth and Honesty, … that I should only impart to Mr. Rich the Secrets of my Conscience in respect to the King’s Supremacy, the particular Secrets, and only Point about which I have been so long pressed to explain my self? which I never did, nor never would reveal; when the Act was once made, either to the King himself, or any of his Privy Councillors, as is well known to your Honours, who have been sent upon no other account at several times by his Majesty to me in the Tower. I refer it to your Judgments, my Lords, whether this can seem credible to any of your Lordships. The typical death for a traitor in England at this time was to be hung, drawn and quartered. It’s a truly horrible way to go, but Henry, being the old softie that he was, commuted his lifelong companion’s sentence to beheading. His head was stuck on a pike and displayed on London Bridge as a warning to other would-be traitors. After a month, his beloved adopted daughter Margaret Roper retrieved it and gave it a proper burial in a family crypt. The rest of his body lays in the Chapel of St. Peter ad Vincula at the Tower of London. 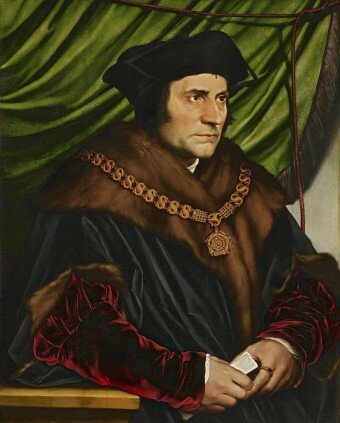 Sir Thomas More was canonized by Pope Pius XI in 1935 and is also considered a saint by the Anglican Church. Indeed, ” A Man For All Seasons”.